More than 80 developers, consultants and planners involved in windfarm development will gather in Battleby, near Perth on Tuesday (3 April) to share information on assessing the impacts of windfarms on birds. The event is part of the themed Sharing Good Practice programme organised by Scottish Natural Heritage (SNH) in partnership with the Scottish Windfarm Bird Steering Group. One of the main aspects of the day will be for industry and science delegates to share their experiences and findings from monitoring windfarm impacts after construction. The event will also focus on the work of the Scottish Windfarm Bird Steering Group. This group will bring together the results of studies at individual windfarm sites and analyse these to provide a better understanding of how individual species are impacted by windfarms across Scotland. This understanding is vital to ensure that new windfarm applications can be assessed on the best possible information, ensuring that bird populations are appropriately protected while new developments are not unduly constrained. The Scottish Windfarm Birds Steering Group includes Scottish Renewables, RSPB Scotland, SNH and Scottish Government, as well as an independent chair and research co-ordinator. Proposals to simplify the Carbon Reduction Commitment Energy Efficiency Scheme (CRC) will deliver significant emissions reductions in large commercial and public sector organisations. CRC is a key part of Scotland’s climate change policy. It is helping business across the country to reduce carbon emissions, contributing to our ambitious climate change targets by incentivising energy efficiency in the commercial and public sectors. Businesses support the simplification of the scheme and will now have the opportunity to comment on the proposals. The proposed package is aimed at retaining the energy-saving and reputational benefits of the CRC, whilst reducing the bureaucracy of taking part. removing cap-and-trade in favour of simpler fixed-price sales. “The CRC is stimulating the market for new low carbon goods and service industries, playing a key part in our efforts to tackle climate change and reduce emissions, laying the foundations for a low carbon economy. “The proposals to simplify the CRC are in direct response to business concerns about the current scheme. The package will reduce the perceived complexity of the scheme, lighten the administrative burden and save businesses money. Forestry Commission Scotland's latest update on its Biodiversity Programme (Woods for Nature) shows that three years of work has resulted in good progress on 39 of 42 objectives. The update report gives an in-depth picture of the Commission’s wide ranging action for biodiversity on the National Forest Estate (NFE) and which it supports in other woodlands throughout the country. “This latest progress report from Forestry Commission Scotland on their biodiversity work demonstrates an impressive range of action for nature in Scottish forests and woodlands - both in managing the national forest estate and also supporting action in private woodlands with grants from the Scottish Rural Development Programme. “I welcome the combination of broad ecosystem scale action - such as creating native woodland habitat networks – and focussed measures in particular places for key woodland species. FCS are carrying out a complete inventory of Scottish native and ancient woodlands, which will be the biggest habitat survey ever carried out in Scotland, and we are on track to complete it by 2013. The Woods for Nature- next steps document sets out what FCS expect to do to continue the programme up to spring 2014. Actions planned include updating our programmes for the key woodland species, completing the Native Woodland Survey of Scotland and using results to prioritise efforts for native woodlands, promoting more landscape-scale ecological restoration projects with partner agencies and bodies; and enhancing our knowledge and advice to help woodland ecosystems and species to adapt to climate change and to new pests and diseases. Banffshire & Buchan Coast MSP Stewart Stevenson has highlighted the importance of World Water Day, which is a global event that takes place annually on 22nd March. “Water is very important to the environment, agriculture, health and trade. This year’s theme is Water and Food Security and I hope that the initiative succeeds in drawing attention on the relationship between water and food security and just how much water is needed to produce food. “Water is one of the vital factors of food production. Future population growth, changing diets, development pressure on land and water and energy cost increases can all lead to a progressive and severe water scarcity that will in turn undermine the food security. “It needs to be stressed that at all steps of the supply chain, from producers to consumers, actions can be taken to save water and ensure food for all. “For those wishing additional information, they should visit: www.wateraid.org”. Black grouse in Loch Lomond & The Trossachs National Park are set to benefit from a major funding package from the Scotland Rural Development Programme (SRDP). On behalf of six private farms and estates, the National Park Authority has successfully secured over £720K for the Callander Black Grouse Project which covers an 8000 hectare area between Callander and Lochearnhead. “The financial package from SRDP is hugely welcomed as significant effort and investment is required to halt and reverse the dramatic decline of this iconic bird in the National Park. The Callander Black Grouse Project has already made progress on the work we have committed to in our National Park Biodiversity Action Plan. The funding now enables the land managers we have worked with to implement positive measures that will help black grouse to breed more successfully. “Some of the measures that will be undertaken this year include grazing management, bracken spraying, scrub thinning, heather burning, tree planting and fence marking. Working on large scale conservation initiatives such as the black grouse project is only achievable when everyone comes together to find workable solutions. Over 1300 hectares of the project area are owned and managed by Forestry Commission Scotland who are also working in partnership with the National Park Authority to actively manage this and other parts of their estate for black grouse . At nearby Loch Katrine black grouse have increased from 35 displaying males in 2009 to 90 in 2011. The counting of the votes for the 2012 Crofting Commission Election took place in the Main Hall of Inverness Town House earlier today (Friday 16 March 2012) and six representatives have been elected to serve on the Commission Board. 28 candidates put themselves forward and 10,877 postal ballot papers were issued to eligible voters. During today’s count all returned valid ballot papers were counted under the Alternative Vote System. Arnie Pirie has been elected unopposed. This is the first time people have been democratically elected by Scotland's crofting community to represent their interests. The official change from the current Crofters Commission to the Crofting Commission will now come into effect on April 1, 2012. The Scottish Government provides financial support to crofters through the Croft House Grant Scheme, the Crofting Counties Agricultural Grant Scheme, and the Crofter Cattle Improvement Scheme. “I'd like to thank everyone who took part in this historic election, the calibre of candidates was extremely high and I'm sure those elected will represent the interests of crofting and crofters with commitment and enthusiasm. Beavers living on the River Tay are to stay and be monitored for at least the next three years, Scotland's Environment Minister Stewart Stevenson announced today. The Tay beavers will be monitored between now and the end of the Knapdale beaver trial in 2015, when a decision will be made about the future re-introduction of beavers to Scotland as a whole. In reaching his decision Mr Stevenson considered a number of ecological, health, land use, legal and environmental factors, as well as the welfare of the beavers themselves. "There is potential for an important and unwelcome precedent to be set so we must consider environmental and other impacts when we make decisions. “After careful consideration of all the various factors, my view is that the best way forward is to allow the beavers to remain in place for the duration of the official trial beaver re-introduction in Knapdale in Argyll. We will take a decision on the future of beavers in Scotland – both those in Knapdale and on Tayside – at the end of the trial period in 2015. "I'm pleased to be asked to chair this local group, which will bring together organisations with differing viewpoints and help resolve any conflicts, as well as gather information on the beavers in Tayside. The information about Tayside beavers, along with comprehensive research from the Scottish Beaver Trail at Knapdale and other sources, should give the Minister a full range of information to make his decision in 2015. We plan to have the group up and running as soon as possible." In Tayside, a number of beavers have either escaped or been deliberately released into the wild, an offence under the Wildlife and Countryside Act. SNH estimate there are about 100 beavers living in the wild in the Tay catchment. The repercussions of this offence has required SNH to find additional money to manage the situation. Monitoring Group will involve key groups such as the Tay District Salmon Fishery Board, and local landowners as well as conservation groups including Scottish Wildlife Trust and the Royal Zoological Society of Scotland among others. There is a licensed and carefully managed beaver re-introduction trial underway at Knapdale in Argyll. This trial is being carried out by the Scottish Beaver Trial (SBT), a consortium of the Scottish Wildlife Trust and the Royal Zoological Society of Scotland. SBT are working with a range of independent specialist organisations to monitor the beavers themselves and their effects, such as on the woodland, loch ecology and public health. “This is the fourth year we have published these maps and I very much welcome the reduction in poisoning numbers. I hope this proves to be the beginning of a continuing reduction in such cases, leading to the end of this outdated, dangerous and cruel practice. “Birds of prey are a key part of our ecosystems and a magnificent spectacle in our countryside. They are valued by locals and visitors alike. “We hope that this is the start of a downward trend in illegal poisoning in Scotland, which in time should also be reflected in an increase in the populations and ranges of some of our most vulnerable species, including golden eagles, hen harriers and red kites. “These statistics reveal the lowest number of cases on record for confirmed illegal poisoning of birds of prey since we started producing these hot spot maps. “This is very welcome and encouraging news and clearly demonstrates substantial progress in this area. From a high of 34 birds of prey illegally poisoned in 2006 we have seen a significant drop to only 16 in 2011, a drop of over 50 per cent. “The reduction in the numbers of Birds of Prey poisoned in 2011 is very good news which should be welcomed by all that wish to see such illegal practices erradicated. This reduction in poisoning incidents is in my view reflective of the ongoing work in relation to the prevention and investigation of such criminality. Anyone who finds a dead bird of prey, and suspects it may have been poisoned, should contact the police as per the PAW Scotland guidance. PAW Scotland is the Partnership for Action against Wildlife Crime in Scotland. PAW Scotland membership encompasses a wide range of bodies with an interest in tackling wildlife crime including conservation, land management, shooting and law enforcement organisations. The maps do not show exact location of incidents, in recognition of the fact that birds may travel some distance after exposure to the poison. The map therefore applies an obscurity factor to avoid any inference being drawn for the exact point of discovery of the bird, but still allows an overview of the worst affected areas. A guide designed to show businesses how they can go green and improve their bottom line has been launched by Scotland’s Environment Minister. Better Business: How to Go Greener with Staff to Improve Performance aims to make companies and organisations realise that climate-friendly employee policies and better productivity can go hand-in-hand. The booklet offers examples of good practice taken from a wide-ranging study covering public and private sector and large and small organisations – including Coca Cola, BT, SSE, Edinburgh Hilton and Aberdeenshire Council. The guide was launched by Stewart Stevenson on the first day of Climate Week 2012 at a meeting of Scotland’s 2020 Climate Group. Earlier, the authors of the report had described its findings to the 2020 group. The booklet not only includes examples of best practice in workplaces, but also looks at how such initiatives impact upon employees’ behaviour at home. The focus is on workplace initiatives which others can copy, and which are either no-cost or low-cost. A detailed report into the research is due to be published in the near future, including details of good practice in Scottish workplaces at organisations as diverse as Aberdeenshire Council, SSE and Halcrow. The guide urges organisations to get involved in low carbon activity as a way of making themselves more competitive, strengthening customer relationships and showing leadership and innovation to build their reputation. It also suggests that it can increase staff morale and loyalty, and build a culture of employee involvement. Bringing staff in at an early stage can build trust and encourage more and better ideas, it adds. Some of the ideas are very basic – using recycling bins, providing bike racks and monitoring energy use- while others represent bigger challenges, such as introducing restrictive policies to reduce car use. Home working (working from home around 90% of the time). Staff are supported by technology to aid remote working (eg laptops, electronic organisers) and training. More than 1000 staff take part, and none have reverted back to the way they worked joining the scheme. An employee survey in 2011 found commuting miles have been cut by 68 per cent. Worksmart is also driving a reduction in the number of workstations required – to a maximum ratio of seven desks per 10 FTE employees. SSE: The energy company has reduced the number of car parking spaces available to staff and introduced a permit system where staff are only allowed to park in the company car park on 4 out of 5 days in the working week. Those who car share can park every day and have access to preferential spaces. Car sharing is encouraged via links to a website that allows staff to find other people looking for lift shares. SSE also puts restrictions on flying (including ‘no fly months’) and instead promotes telepresence videoconferencing. Halcrow: The engineering firm has set up an innovative scheme at its Glasgow office, striking a deal with local bus companies to provide its staff with subsidised fares. These are self-funded from income generated from charging staff £5 per week to use the company car park. Parking spaces are allocated according to a range of criteria with those who car share, or travel longer distances, given higher priority. Staff are also provided with information about public transport and cycle routes. In 2009, 12,300 subsidised bus journeys were made among the 350 staff, with estimated saving of 6.4 tonnes CO2. The self-funding scheme means this is an initiative which can make a significant impact without any significant costs. The Scottish Government announced today that 43 groups across Scotland have been awarded over £6.9 million for the next three years under the Climate Challenge Fund (CCF). The CCF helps communities reduce their carbon footprints and contribute to Scotland reaching its ambitious climate change target of reducing carbon emissions by 80 per cent by 2050. The current round of applications, assessed by an Independent Grants Panel, also introduces the first successful intake of applications for the Junior Climate Challenge Fund which aims to allocate funds to projects that are run by young people. “Scotland’s ambitious and world-leading climate change targets can only succeed with the active involvement and participation of communities across the country. Therefore the initiatives we back under the Climate Challenge Fund are a great way of supporting behaviour change that helps drives down carbon emissions. “We are tackling climate change from the grass-roots up and this latest funding round will support 43 projects with a total of £6.9 million support, demonstrating that communities in Scotland are serious about addressing their carbon footprint. 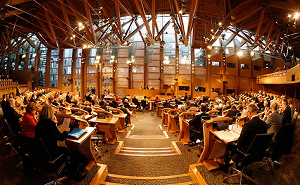 Since its launch in 2008, the Scottish Government has made £37.7 million available to community groups through the CCF. Today’s announcement follows the confirmation of a further £30.9 million made available to communities by the CCF for 2012-15 and will have seen over 500 awards made across 365 communities. A prize of £50,000 is on offer to software developers who can produce the best App to help businesses in Scotland reduce their carbon emissions. The Scottish Government, SSE, SEPA and Microsoft launched the national competition today [Monday 12th March] in an effort to produce an App targeted specifically at small and medium-sized businesses (SMEs). The SME EnviroApp contest was launched on the first day of Climate Week 2012 by Environment and Climate Change Minister Stewart Stevenson at a meeting of Scotland’s 2020 Climate Group, whose members have been instrumental in bringing the project together. The App, which will be free to download, aims to assist owners of SMEs in Scotland to measure, manage and reduce carbon emissions – and play a part in achieving the 2020 targets. “This is a great example of Scotland’s public and private sectors working together to develop creative, practical and effective solutions for reducing greenhouse gas emissions. “It can be extremely difficult for small businesses to devote time to the low carbon agenda. The idea of the app is to offer them a straightforward way to measure, manage and reduce their environmental impact. Funding from the four sponsors has created the prize fund of £50,000. The winner who makes best use of Microsoft technologies will also be taken to the company’s Seattle headquarters to meet the global software development and environment teams. All those interested in developing their ideas are invited to join an intense App Development workshop to be held in Scotland in June that can provide further encouragement and support. The winning app will be made available for free download from the Scotland’s 2020 Climate Group website and sponsors’ websites. It will be promoted across the 2020 Group membership, with businesses encouraged to report their actions online to build a collective picture of the progress of Scottish businesses towards climate change targets. The SME EnviroApp prize winner will be assisted in making the application widely available across a range of technology platforms and devices. The App will also be promoted by the Scottish Energy and Resource Efficiency Service (SERES), a virtual partnership established to bring together the existing range of key business support and advice delivery bodies in Scotland. This service will make it easier for businesses to access professional energy and resource efficiency advice and provide a more consistent and comprehensive service through joint marketing, events and the cross-referral of requests for assistance. Initial judging will be conducted by a panel of 2020 Climate Group members, business group representatives and carbon management experts. Banffshire & Buchan Coast MSP Stewart Stevenson has highlighted the importance of Prostate Cancer Awareness Month, which takes place this month. “I hope that the awareness campaign will succeed in its aims to raise the profile of prostate cancer considering that it is the most common cancer in men and that the disease kills 10,000 men in the UK every year (with around 36,000 diagnosis each year). “It is vital that we all increase our understanding of the disease as well as be able to recognise possible symptoms so that early detection is possible. SCOTLAND is setting a good example to other countries in its approach to the impact of climate change. Last October I visited Scotland to deliver the Magnusson Lecture on the theme Climate Justice – Challenges and Opportunities. I explained that the focus of my work in the Mary Robinson Foundation – Climate Justice – is to take a human rights and developmental approach to climate change, to safeguard the rights of the most vulnerable and share the burdens and benefits of climate change and its resolution equitably. I was glad to deliver my message in Scotland because it has an enviable record in tackling climate change, and is clearly benefiting economically. The Scottish Parliament passed a Climate Change Act in 2009 which gives legal character to the national commitment to combat climate change. That means that Scotland is numbered amongst the few countries in the world to adopt climate change legislation – the most meaningful signal of a nation's commitment to act. Enshrining mitigation commitments in law demonstrates not just a desire to act but also a willingness to be held accountable both at home and internationally. Last week's historic debate on climate justice in the Scottish Parliament and the unanimous cross-party parliamentary support for the motion was evidence of Scotland's commitment to championing climate justice. It is taking a human-rights-based approach to combating climate change which seeks equitable outcomes to both protect the vulnerable and provide them with access to benefits arising from our transition to low-carbon development. Scotland is investing in the transition from oil to renewable forms of energy and is taking impressive steps to embrace low-carbon, climate-resilient development. Scotland's climate change legislation lays the groundwork and this is complemented by initiatives from government including a low carbon economic strategy, an energy-efficient action plan and a public engagement strategy. It is also impressive that these efforts are supported by the country's economic development agency Scottish Enterprise through its Low Carbon Implementation Plan which works with business to exploit low-carbon opportunities. These experiences are helping investment in Scotland and will make it a valuable partner to developing countries as they strive to put in place similar policies and strategies. The Scottish Human Rights Commission is a champion of climate justice. Its chairman, Professor Alan Miller, stated that "climate change has adverse implications for the full enjoyment of human rights, and international human rights obligations, standards and principles have the potential to inform and strengthen policymaking at every level". In short, Scotland has a forward-looking climate change strategy with the necessary legislation in place and an inclusive reach which ensures that all of the country's main players are on board. First Minister Alex Salmond has said: "We face a moral obligation to act against growing climate chaos and a clear economic imperative to avoid much greater future costs." It is not surprising that Al Gore praised Scotland for the leadership it is giving in rallying business and civic and political leaders to the cause of renewable energy. Leading by example takes on an added urgency as we shape the debate on how to progress the decisions made at the Conference of the Parties to the UN Framework Convention on Climate Change in Durban. The Durban Platform set out a roadmap towards the goal sought by all who are concerned about climate change – a legally binding instrument – by 2015. There is a lot of work to do. Scotland's commitment to climate justice, and the practical actions it is taking to reach that goal, show the way for all countries. 6 South Leinster Street, Dublin. 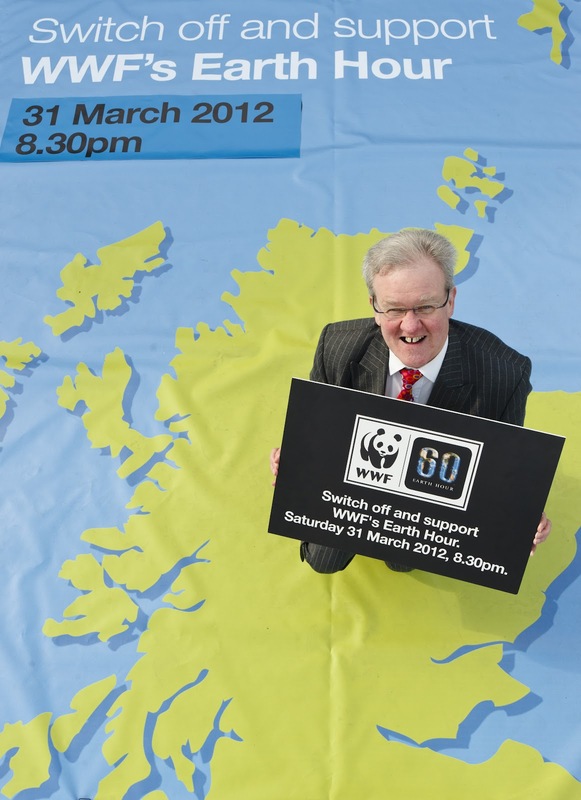 Banffshire & Buchan Coast MSP Stewart Stevenson has given his backing to WWF’s Earth Hour and has urged local residents, businesses and organisations to do the same by switching off on Saturday 31st March. From 8:30 on 31 March, millions of people around the world will turn their lights off for 60 minutes to demonstrate their support for action against the impact of climate change on people and wildlife across the world. This year, in addition to the lights going out at iconic Scottish locations, including Edinburgh Castle, WWF is encouraging community groups and local organisations to join in the fun. “Scotland has been at the forefront of the fight against climate change, with targets for carbon emission reductions that are world-leading. Yet if we are to tackle this problem we need people from all parts of the world to follow this example which is why WWF’s Earth Hour is so important. “By coming together to signal our determination to tackle climate change through millions of people turning off their lights for an hour, hopefully we can inspire more countries around the world to take the action needed to address the problem. “It is often the poorest countries that will suffer the biggest effects of climate change, which is why just this week the Scottish Government confirmed that we will launch a Climate Justice Fund to help the least developed countries adapt to the effects of climate change. "WWF’s Earth Hour is a simple way for people to show their support for strong action on climate change. MSPs are leaders in their communities and their support is very welcome. Banffshire & Buchan Coast MSP Stewart Stevenson is encouraging his constituents to use the awareness-raising campaign of National No Smoking Day as the perfect opportunity to give up the habit. Smoking continues to be one of the main causes of preventable illness and death in Scotland, and with Wednesday 14th March being this year’s date to highlight the benefits of giving up cigarettes, Mr Stevenson wants to see more local residents take advantage of this opportunity. “People start smoking at different ages and for a wide variety of reasons, however doing so over a long-term period significantly damages your health. “The smoking ban in 2006 in public places made it increasingly unacceptable to smoke socially, and there is little incentive so stand outside pubs, clubs, and workplaces. Scotland will launch a ‘Climate Justice Fund’ this spring in response to the impact of climate change on the world’s poorest communities, it was announced today. In what is understood to be the first parliamentary debate on the issue worldwide, the Scottish Parliament debated climate justice today. The debate highlighted the increasing impact of climate change on the world’s poorest – who despite contributing the least to the causes of climate change, in terms of carbon emissions, are worst equipped to respond to it. During the debate Minister for Environment and Climate Change Stewart Stevenson confirmed the Scottish Government manifesto commitment to co-ordinate a climate adaptation fund will be taken forward, by launching Scotland’s Climate Justice Fund in the coming months. The announcement follows the First Minister championing the need for climate justice during recent visits to China and the Gulf. “It is a travesty that it’s the poorest people in the world’s most undeveloped countries who are hardest hit by climate change. They are least able to respond to the impact of increasingly erratic weather patterns and ever more frequent climate-related disasters. This situation cannot continue and the onus is on the international community to take action. “Therefore I’m pleased to confirm to Parliament today that the Scottish Government is progressing plans to establish a Scottish Climate Justice Fund, which will be launched in the next few months. Scotland’s Climate Justice Fund – which will meet the manifesto commitment to co-ordinate the establishment of a climate adaptation fund – is expected to be operational from the spring, with further plans to be announced in the coming months.